Below you will find our review of the ZTE Quartz from Tracfone with lots of details facts about this new phone. TracfoneReviewer works hard to provide useful and accurate information, and we will update this post as needed. Tracfone continues to upgrade their phones offered to consumers with the latest smartphone, the ZTE Quartz that features a 5.5" touchscreen, the largest available at this time. Tracfone is a prepaid wireless cell phone company that offers both phones, and cell service by contracting with various other companies. Over the past few years Tracfone has steadily offered more and more smartphones to use with their service. Most of their Android smartphones are for CDMA networks through Verizon, but some phones use GSM networks through AT&T. Tracfone also still offers many non-smartphones. Until the Quartz, the Alcatel Onetouch Icon Pop had the largest screen size at 5". All of Tracfone's other smartphone options were between 3.5" and 4.5". For some, a larger screen is very desirable, and the current trend for many smartphone manufacturers. This smartphone brings some key features many users have been looking forward to, but it also has a handful of drawbacks that one may need to consider. For example, the battery is unremovable, which means if it stops working, you will have to get a new phone entirely, not just a new battery. The Moto E is similar in this respect. Now let's take a look at the full list of features and specifications for the ZTE Quartz which will give us a better idea of all it has to offer. Size: 6.10" x 3.09" x 0.35"
A lot of great features in this list, with several that are surprising to us, especially the battery life of up to 18 hours talk time. We would have expected the large screen to drain the battery quickly, but instead the phone comes with plenty of power. The Quartz has all the other typical features for an Android Tracfone, like Bluetooth capability, WiFi access, Hands free speaker, voicemail, caller ID, and more. There are plenty of exciting features, but there are also a couple of things we think consumers should be aware of before buying the ZTE Quartz, so let's jump into our review. The main feature on this phone, and the reason why many will be interested in buying the Quartz, is the 5.5" touchscreen. This is the largest smartphone available through Tracfone yet, and we are glad to see that Tracfone continues to improve what they have to offer. At 5.5" screen, that's starting to get close to a tablet size, and may not fit in your picket very well. However, it will be much more convenient to use the phone to read, watch videos, and view other media. Along with a large screen, the Quartz also has has 8 GB of internal memory, 1 GB RAM, a Quad-Core processor and a MicroSD slot for external memory. The LG Power and LG Sunset also come with similar specs which allows you to load the phone with a variety of apps and be able to run them without issues. The more RAM a phone has, the better it does at multitasking and running multiple apps at once. The 8 MP rear camera on the Quartz is quite adequate and comes with autofocus, touch to focus, flash, and face detection. You can record videos at up to 720p quality which is HD. The front facing camera is a modest 1 MP which you can use for video calls and selfies. While it would be nice to have a better front camera, it is hard to expect that at this price point. But before we get ahead of ourselves, we want to share a couple of dislikes for the Quartz. The Quartz comes with a huge screen, but it also comes with some sacrifices, and one of those is resolution for the screen. Most of the phones from Tracfone have a DPI of somewhere between 200 and 300, so the Quartz fits in this range, and doesn't have any noticeable issues. Another dislike we have about the ZTE Quartz is that it is a little outdated in two areas: 3G Connectivity and Android 4.3. Tracfone now allows 4G LTE devices through their BYOP program, and we want to see more 4G LTE devices offered directly through Tracfone, like the LG Sunset. But the Quartz only has 3G service. Along with that, the Quartz doesn't have the latest version of Android, it has 4.3. This isn't a big deal, but it is always better to have more updated versions, and we would have expected at least Android 4.4. Lastly, we have some concerns with the Quality of ZTE phones. The older, ZTE Valet which came to Tracfone a few years ago, had a number of reported issues including poor WiFi strength. We've also seen mixed reviews on the ZTE website for the Quartz, where some users complain about various problems with the phone. What this boils down to is that if you get the ZTE Quartz, you may get a great phone and have no problems, or you may experience issues that require you to return the device or get it repaired. So be aware of this, and we will share updates as more user information becomes available. No brand of phone is without problems, but LG devices seem to have less issues, and ZTE seems to have a few more. If you're looking for a phone with a big screen, and you don't want to venture into Tracfone BYOP, the ZTE Quartz is your best options. It is similar to the Alcatel Onetouch Icon Pop, but the Quartz comes with a larger screen, more internal memory, and better battery life. If you're looking for a more well rounded smartphone, the ZTE Quartz is up near the top of our list, along with the LG Power, LG Sunset and LG Ultimate 2. All of these phones have different pro's and con's that may make one better than another for you. Visit our Android Tracfone page which has all the smartphones with their key stats so you can quickly compare them. Overall the ZTE Quartz brings a lot of great features, but it has a couple of drawbacks that may or may not be an issue for you. We have only found the Quartz on Amazon and eBay through a Tracfone third party retailer, but this has also been the case for several other phones released by Tracfone. We hope this review was helping and provided you with enough information and details to make your own conclusions. Leave a comment if you have any thoughts or questions. If you're looking into a new Tracfone device, you should visit our Tracfone Reviews List, which contains all the phones we have reviewed and are available from Tracfone. Also take a look at our post on How Data Works with Android Tracfones, and How Minutes Work with Android Tracfones. Both posts share enlightening details on some of the new things you should know about when upgrading to a smartphone. This review by TracfoneReviewer covers the LG Sunrise and will detail the major features for this phone, as well as our comparison to other options available. We hope this information will be helpful, and will continue to update as needed. The LG Sunrise is an Android smartphone that uses GSM networks through Tracfone. It is one of a growing variety of smartphones available from Tracfone, but one of only a few that use GSM networks. Tracfone is a low cost prepaid cell phone service provider that contracts with major cell phone companies like Verizon and AT&T to use their cell networks to provide service. Tracfone also offers cell phones to use on their networks, and the LG Sunrise is one of these devices. The Sunrise is fairly similar to several other phones which have also been released by Tracfone over the last few months. The LG Sunset (L33L) shares a similar name, but features a larger screen and better specs. 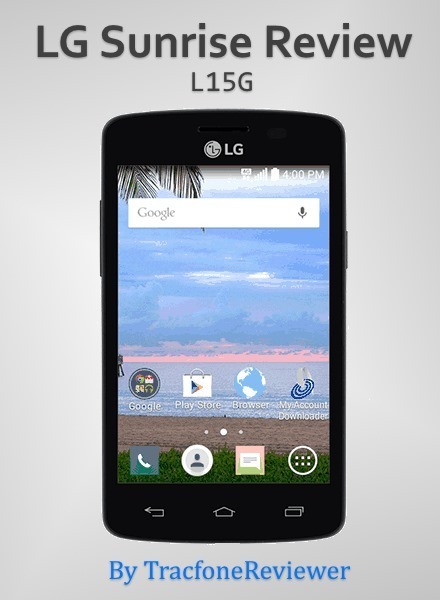 The LG Lucky (L16C) is almost identical except that the Lucky uses CDMA (Verizon) networks. While the Sunrise isn't a top of the line device, it does offer some great features in a small size. This phone packs some good features into a small size, but if you want the latest and greatest phone, this isn't it. This is a budget friendly small sized smartphone for low to moderate users. It is an improvement over phones like the ZTE Valet or LG Optimus Dynamic, but can't keep up with the LG Power or Alcatel Onetouch Icon Pop. Time to get into the full list of features and specs for the LG Sunrise to really see what this phone is all about. Probably the best feature on this phone is that it uses Android 4.4, which I actually prefer even over Android 5.0 (we won't get into that here though...). The Sunrise also has many other good specs that are better than most phones from Tracfone, but not the best. Now we're going to take a closer review of the LG Sunrise and cover what we like and don't like about this smartphone device. Note - We are getting reports that the LG Sunrise may also have 4G connectivity along with 3G. Let us know in the comments with your experience! The Sunrise comes with Android 4.4 which is not the latest version of the operating system, but a very popular version that is compatible with almost all oft he apps available from Google Play. With Android you have access to millions of different apps that can do almost anything you can think of. You can get some ideas on our List of the Best Android Apps for Tracfone Users. The LG L15G is special because it is one of the first smartphones from Tracfone that users GSM networks. The 'G' at the end of its name signifies that it runs on GSM networks, which in this case is AT&T. 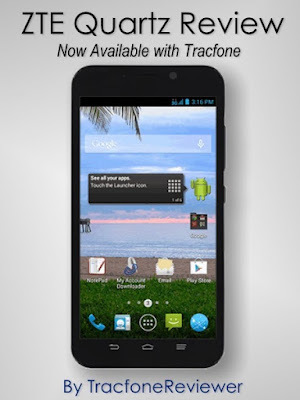 We are very excited about this because it allows many more consumers to have access to smartphones on Tracfone. Previously, only people in areas with good Verizon coverage could get smartphones with Tracfone. But now, areas with AT&T coverage will also work. You can take a look at our GSM vs CDMA for more details on the difference between these networks, and to help you choose which is right for you. While the Sunrise doesn't have spectacular specs, they are adequate. 512 MB RAM with a Dual Core Processor is just barely enough to keep up with most apps. We initially were not sure about the internal memory, but have since been able to confirm it; the phones has 4 GB of internal memory, along with a 4 GB external SD card which is convenient. There are a couple of things we don't like about the LG Sunrise, starting with the small screen. At 3.8" it just isn't all that impressive in a market where most phones are closer to 5". However, some users actually prefer the small screen size, so just be aware of this feature as you consider the phone. Battery Life for the L15G is mediocre and may not last a full day with consistent use. If you need a device with good battery life, the Moto E would be a much better option. The main thing we don't like about this phone is that it just doesn't really impress. It has a lot of average features and specs that will perform fine for most people, but may disappoint anyone who has used a higher-end smartphone. The Sunrise is similar to several other devices available from Tracfone, most notably the LG Lucky, but also the Samsung Galaxy Stardust and LG Optimus Fuel. All of these phones have smaller sized screens (3.8" to 4") and similar specs with various differences. Obviously the most important difference is that the Sunrise uses GSM networks will the others all run on CDMA. Several phones are more impressive than the Sunrise, including the LG Power, LG Sunset and LG Ultimate 2. Each of these phones have ea larger screen, similar or more internal memory, and similar or better processors. We would recommend the LG Sunrise over a few older devices, like the LG Optimus Dynamic, Hquwai Glory and ZTE Valet. The Sunrise outperforms each of these phones in almost every way. As you can probably see, the LG Sunrise is a mid-level smartphone that offers a variety of great features in a small size. It will likely be suitable for people who want some access to apps, but don't plan to use it for too many things. For the majority of people, we would recommend looking into some of the newer smartphones that come with larger screens like the LG Sunset mentioned above. These phones will have faster performance and should last longer. The LG Sunrise was available for short time on the Tracfone website, and may have gone out of stock. We have also found it on the Walmart website (and some have found it for as little as $10 at Walmart). It may also be available on Amazon and eBay, but we haven't seen it listed yet. You can probably shop for it wherever Tracfone devices are sold, and you may find it at one of these locations. Covers and Cases for the Sunrise are plentiful because there are several models from LG that are the same size. Search Amazon for LG Sunrise Cases and you will see many options. For more resources on this phone, view the Sunrise Interactive Tutorial from Device Anywhere, or dive into the LG Sunrise User Manual. We hope this review is helpful for you and please leave a comment with any thoughts or questions. Also join more than 1300 followers on Facebook where you can get the latest news and reviews, while participating in a fast growing community of Tracfone users. We recently took an in-depth look at How Data Works with Android Tracfones which may be useful for you if you're shopping for a smartphone. You can also take a look at our Tracfone BYOP page where we include all the details about bringing your own smartphone to use with Tracfone, and even share a list of compatible phones. We collect and share here the newest codes we find to use with Tracfone that are working in September 2015. 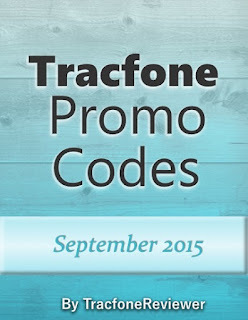 Here at TracfoneReviewer we want to help everyone get the free bonus minutes, so we make a simple list of codes below. Promo codes do not work for Android Tracfone Devices or for the BYOP program, but you can follow those links to learn more about the many smartphone options available with Tracfone. The list of codes below are selected because they have been tested and are working for this month. But if you're looking for more options, visit our full Promo Code Page where we share all the various codes. And don't forget to check the comments for additional help from other visitors. If you're an Android user, or just curious, take a look at our new post on How Data Works for Android Tracfone Devices. It also includes an analysis of which data card is the best value, and how they compare to regular airtime cards. We also recently updated our list of the Best LG Phones with Tracfone, so take a look! And if you're in the market for a new phone, see our recent list of Tracfone Deals and Sales.